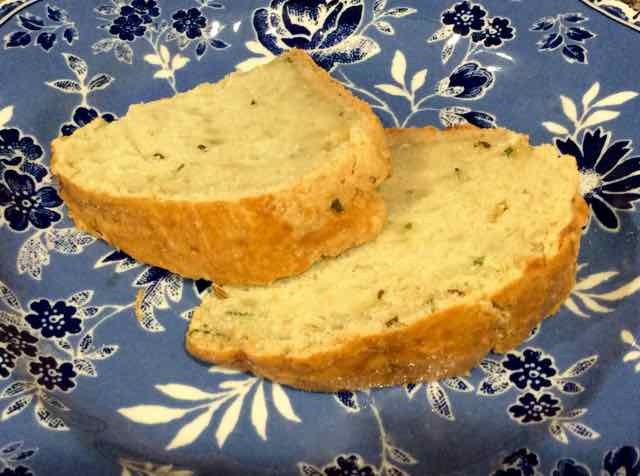 Irish Potato Bread is similar to Irish Soda Bread because both have a texture that is a cross between a biscuit and regular bread and both are yeast free. The potato bread is savory not sweet like the soda bread. Both are easy to make and delicious. 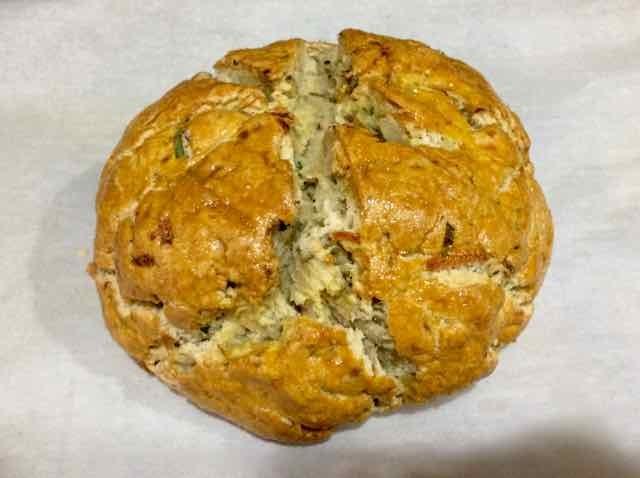 I had never heard of Irish Potato Bread until I came across the recipe while browsing the internet, but decided to give it a try. The scallions or chives in the bread make it very tasty. It is wonderful fresh and when a bit older it is great toasted. The bread is hearty and very satisfying. It is perfect to eat with a meal or soup or just anytime as a snack. 1 Tbs. + 2 Tsp. Beaten Egg Yolk - for brushing the top of the bread before baking. 1) Position a rack in the center of the oven. Preheat the oven to 375℉. Line a baking sheet with parchment paper and set aside. 2) In a large bowl add all of the Wet Ingredients and mix well. 3) Add all of the Dry Ingredients to the wet ingredients in the bowl. 4) Mix the wet and dry ingredients together, the batter will be stiff and sticky. Knead together to incorporate all of the dry ingredients well. Dough mixed together and kneaded. 5) Form a ball with the dough and place it onto the prepared baking sheet. 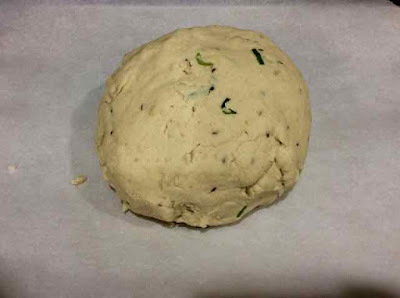 Flatten the dough slightly into an 8” round loaf, keeping it mounded in the center. I thought that the dough might spread and I did not flatten it enough. Heads up: The dough does not spread at all, so make it the height that you desire before baking. 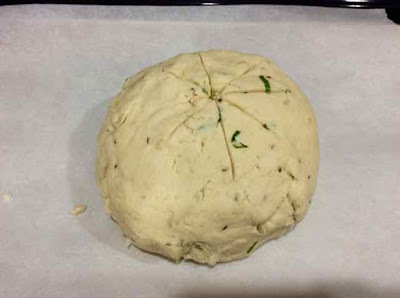 6) Use a serrated knife to slash a cross on top of the dough. If desired you can slash another cross between the first cross to form a star. Star pattern of slashes on the loaf of Irish Potato Bread. 7) Brush the top of the loaf with the beaten egg yolk. Loaf brushed with beaten egg yolk. 8) Place the loaf on the baking sheet into the oven and bake for about 55 minutes. The Irish Potato Bread is done when it is golden brown and the bottom sounds hollow when tapped. 9) Allow the loaf to cool at least an hour on a wire rack before slicing or eating it. Enjoy! GLUTEN FREE IRISH POTATO BREAD Makes one 8” round loaf INGREDIENTS WET ¾ cup (from a potato that weights about ¾ lb. ) Grated Raw Potato (Wash, peel and then grate a potato using the coarse or large hole side of the grater. Squeeze out any excess moisture using cheese cloth or paper towels.) ¾ cup (from a potato that weights about ¾ lb. ) Mashed Potatoes (cooked potatoes that are mashed and cooled or left over mashed potatoes) 1 large Egg 1 large Egg White ⅓ cup Oil - Light Flavored such as sunflower or canola ¾ cup Milk - Fat Free (For Dairy Free use DF milk) 2 Tbs. Minced Chives or the Green Part of a Scallion 1 tsp. 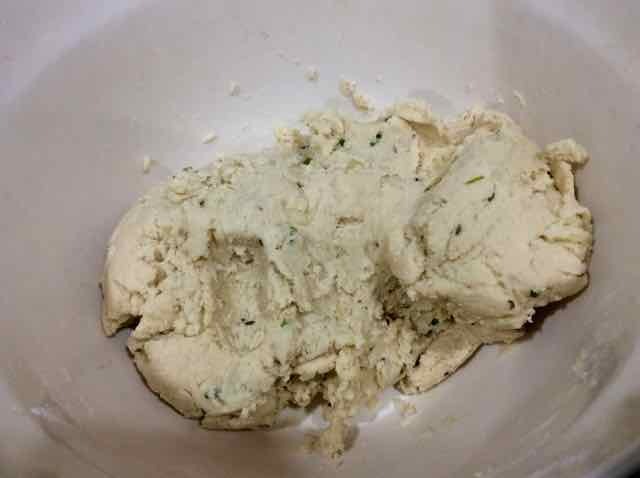 Caraway Seeds DRY 1 ¼ cups Sweet Rice Flour 1 ¼ cups Tapioca Flour or Starch ¼ cup Sorghum Flour ¼ cup Coconut Flour ¼ cup Chickpea Flour ¾ tsp. Xanthan Gum 1 tsp. Sea Salt 1 Tbs. + 2 Tsp. Baking Powder 1 large Beaten Egg Yolk - for brushing the top of the bread before baking. DIRECTIONS 1) Position a rack in the center of the oven. Preheat the oven to 375℉. Line a baking sheet with parchment paper and set aside. 2) In a large bowl add all of the Wet Ingredients and mix well. 3) Add all of the Dry Ingredients to the wet ingredients in the bowl. 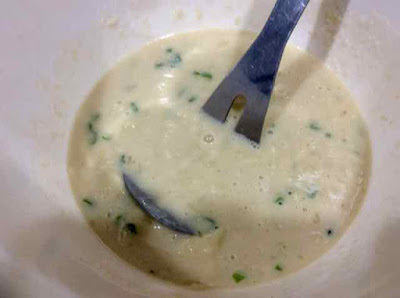 4) Mix the wet and dry ingredients together, the batter will be stiff and sticky. Knead together to incorporate all of the dry ingredients well. 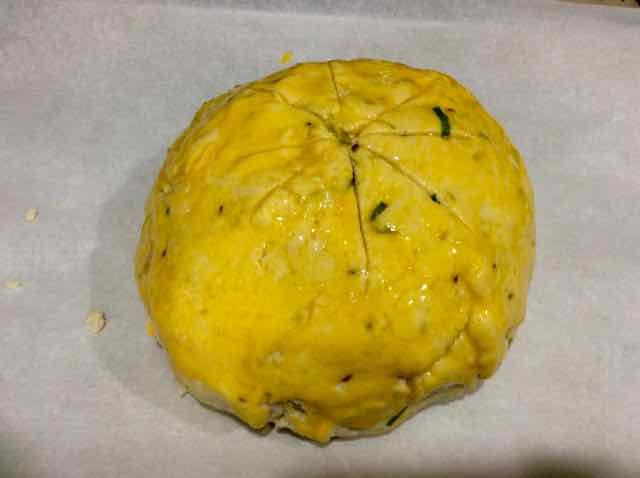 5) Form a ball with the dough and place it onto the prepared baking sheet. Flatten the dough slightly into an 8” round loaf, keeping it mounded in the center. 6) Use a serrated knife to slash a cross on top of the dough. If desired you can slash another cross between the first cross to form a star. 7) Brush the top of the loaf with the beaten egg yolk. 8) Place the loaf on the baking sheet into the oven and bake for about 55 minutes. The Irish Potato Bread is done when it is golden brown and the bottom sounds hollow when tapped. 9) Allow the loaf to cool at least an hour on a wire rack before slicing or eating it. Enjoy!